Whenever the market shifts, as ours does with such regularity, we come to inflection points. Opinions invariably divide on how those inflection points will pan out - it's the nature of disruption. This week's quarterly financials from Nintendo, which highlighted missed sales targets for the Wii U and 3DS, have brought exactly such a situation into sharp focus. When a company as big as Nintendo, which has until so recently been held up as a paragon of adaptive success and market growth, stumbles, pundits and punters alike are quick to make a diagnosis. We're no hive mind at GamesIndustry International, so we prefer to give you both sides of the argument whenever we can. To that end, we have two pieces about the impact of both the financial results and the sales figures revealed by Iwata, each arguing from a different perspective. Yesterday we published a piece from Steve Peterson, our West Coast Editor, giving his take on the company's prospects. Below, we have regular columnist Rob Fahey, who takes a more optimistic view. Another nail in the coffin of the dedicated games console. Nintendo's Dreamcast moment. The vultures were out in force to greet Nintendo's latest revision of its sales forecasts, circling the Kyoto-based company with a naked and unseemly hunger. Wii U has missed Nintendo's own sales targets; the clouds are gathering, the doom-mongers are checking their funeral outfits. The headline figure that drew absolutely everyone's attention was this - by the end of March, Nintendo will have sold 4 million units of the Wii U, which is significantly down from the 5.5 million it had originally expected to sell. 3DS sales are also down somewhat on projections, at 15 million rather than 17.5 million for the full financial year, though less attention has been paid to that stat, largely because 3DS is already solidly established in the market, with a 30 million installed base. So here's the bleak scenario - the Wii U, with only 4 million installed at the end of what might reasonably be considered its "launch window", has failed to capture consumer imagination and isn't a viable platform for third parties. Software projects get cancelled, publishers draw back their support, sales slow down even further and the platform enters a death spiral. Within a few years, Nintendo is forced out of the hardware business and follows Sega into third-party publishing - on tablets and mobiles, most likely. I have quite a lot of problems with that scenario (and with some of the more moderate versions of it which have also been floating around). For a start, it may not match Nintendo's targets, but 4 million units sold after a few months on the market isn't actually that bad for a new console. It's very significantly better than either the PS3 or the Xbox 360 managed; in fact, the only home console that has outperformed the Wii U's launch window, in terms of units sold, is the Wii itself. "Nintendo's new home console is always going to be stacked up against its old home console, and that's a tough thing to measure up against." That's what you might call a tough comparison, even if there's a harsh fairness to it. Nintendo's new home console is always going to be stacked up against its old home console, and that's a tough thing to measure up against given that its old home console was the fastest selling and most profitable home console in history. Old hands at Sony might wince sympathetically; the PS3, despite matching the Xbox 360's worldwide sales curve at almost every step on the way, has often been portrayed as a bit of a failure due to comparisons with the all-conquering PS2. The 360, by contrast, is enshrined in conventional wisdom as a triumph, because it built so strongly on the not-terribly-successful original Xbox business. Comparisons like those are useful for building narratives - especially bull-and-bear market narratives, in which a company's actual performance is vastly less important than its trajectory. They're not, however, very useful for building an accurate picture of a product's viability. Wii U has missed its targets (Nintendo's own, so the company can't even accuse analysts of over-egging the pudding in this case) and hasn't performed as well as the Wii did; there's a bearish narrative about decline in there. On a practical level, though, Wii U has sold more units than Xbox 360 or PS3 did at launch, it's lost far less money (in fact, Nintendo will record a full-year profit, compared to multi-billion dollar losses for Microsoft and Sony's games divisions in their launch periods) and, crucially, it can't lose the support of its largest developer and publisher, because its largest developer and publisher is Nintendo itself. Is this to say, then, that all is rosy in the Wii U garden? No, of course not. The console clearly hasn't captured consumer imagination to the extent to which Nintendo expected, and a major push will now be needed both in terms of software and in terms of marketing and communication. The biggest risk Nintendo faces is that of failing to address the huge audience of casual consumers who bought in to the Wii, which would confine the firm to its core audience - but that core audience is itself quite significant, on the sale of 20 to 30 million consumers worldwide. Capturing additional casual consumers (or core consumers who fall more readily into the Sony and Microsoft camps, but may be swayed by certain software titles) would drive the console past those levels; even if it achieves only half the success of its predecessor at this task, it's hard to see the Wii U ending up with an installed base much south of 50 million. "The biggest risk Nintendo faces is that of failing to address the huge audience of casual consumers who bought in to the Wii." The stock market won't like that, and that's fair enough. Nintendo was ludicrously overvalued in the previous generation - at one point becoming Japan's most valuable company, ahead of the world's top car-maker, Toyota - and if the Wii U and 3DS don't match up to the sales trajectory of their predecessors, the next generation will see an undervaluation that may be equally ludicrous. There will undoubtedly be grumbling at this from shareholders, but Nintendo is more insulated from shareholder discontent than many other firms, thanks to the large shareholdings of former president Hiroshi Yamauchi (who owns the single largest voting bloc in the firm) and of Japanese banks and institutions, who are generally less activist as shareholders than their western counterparts. Share price decline, however, does not equate to product non-viability, nor does it precipitate a collapse in a company's own market - or even its profits. The viability of a product needs to be considered in more solid and less sentiment-driven terms. Does it make a profit? Does it have a large enough installed base to justify continued development? These are, of course, moving targets. Profitability rises as a console's lifespan continues, with production costs generally dropping off faster than hardware price cuts reduce revenue (although there are exceptions, the 3DS being an obvious one). Rising software sales also increase profitability - note that the Wii U, despite being Nintendo's first console to launch as a subsidised piece of hardware, is comfortably in the black after its launch, having sold 3.8 units of software for every console so far. That can be expected to rise significantly; the Wii, often decried as the console that sat unloved and gathered dust, actually has an attach rate of 8.7 software units for every console sold. Finally, foreign exchange movements also influence profitability, and after a few very tough years, the Yen is finally nudging in a positive direction for Nintendo (and Sony). After trading at under 80 Yen to the dollar for most of 2011 and 2012, it's now over 90 Yen to the dollar, a level it hasn't reached since mid-2012. It's still a long way from the pre-financial crisis levels, which rarely dipped below 100 Yen to the dollar, but it's enough to win Japanese manufacturers some breathing room in their profit figures. Installed base viability is also a moving target. Bigger is better, but it's not as simple as that; you can't simply say "well, there are half a billion iOS devices out there and even more Android devices, so games consoles are irrelevant now", even though some commentators try to do exactly that. For many types of software, a machine with a 30 million installed base made up entirely of active gamers who are willing to spend $40 on software every few months is more viable than a system with a 150 million installed base whose users aren't hugely engaged with game software and only spend sporadically, in smaller amounts. Conversely, there are many types of software which absolutely thrive in the latter environment, and would fail utterly in the former. Development costs are also a big factor, because if your development budget soars, you must be able to address a bigger market (or somehow charge them more money) in order to counterbalance that. "In other words, when it comes to Nintendo, stop trying to bring everything back to bull and bear market perspectives." In other words, when it comes to Nintendo, stop trying to bring everything back to bull and bear market perspectives. Those have their place, but they're not terribly useful in attempting to predict the shape of the games industry as we proceed towards an uncertain future. They tend to give us extremes and ignore subtlety; where any individual with a shred of intelligence and insight can look at the news that "Wii U isn't doing as well as Wii" and interpret that in context as a decline but not necessarily a catastrophe or a herald of collapse, a market-led approach allows for little if any of that subtlety. Nintendo has a lot of work to do on Wii U, but we've been here before - it had a lot of work to do on the 3DS as well. While 3DS' price cut helped a great deal, much of the real work was done through significantly improving and bulking out the console's software line-up, and a similar process is underway with Wii U. One need only look to the rapt response which the recent Nintendo Direct broadcast received from media and Nintendo fans alike to see the truth of Nintendo's situation. This is a software company at heart. Its consoles are enabling hardware for its software, and as such, they sell in parallel with major software launches. Of course, this is a valid argument in favour of Nintendo's ultimate destiny outside the hardware market entirely, but for now, the company isn't willing to give up that level of control - and for now, it doesn't look like it needs to. I don't expect Wii U to match the success of Wii, in the medium or long term - but equally, I don't count myself among those who expect it to be Nintendo's last console. Sentiment is negative right now, but fundamentals aren't, and for a business like Nintendo, it's the latter that counts. Available for Wii and GameCube. SMB share support from WiiSX. Graphics and user interface tweaks. Recognize the NTSC Zelda bonus disc. Changes pitch according to emulation speed. Affects composite video, similar to GameCube output. Recommended for lower-end CRT TVs. Automatically load a ROM file on startup. Project64K is a Nintendo64 emulator with Kaillera support. EA is closing in on a couple of milestones for its Madden NFL franchise. The publisher has announced that the game will celebrate its 25th anniversary by ditching the upcoming season’s year in the title for Madden NFL 25. The game is set to launch on August 27th. EA has also revealed that the American football series has sold roughly 99m units, which translates to a lifetime revenue of $3.7bn. This year’s offering will most likely take it past the 100m sales mark – something only Need for Speed, FIFA, and The Sims franchises have accomplished for the publisher. The original John Madden Football was released back in 1988 on personal computers, and the NFL license was picked up for the series with Madden 94. A new patch for the Wii U edition of Call of Duty: Black Ops 2 addresses some longstanding Wii Remote issues. Fixes that apply to all platforms have also been introduced with the new patch. The full notes can be found on the Call of Duty messageboard. Sonic & All-Stars Racing Transformed will release on 3DS on February 8 in Europe and February 12 in North America, Sega has confirmed. Along with 22 playable characters and 20 tracks, the 3DS version will don support of playable Mii characters, StreetPass challenges, and eight-player multiplayer using Singe- and multi-cart play.The game will launch as with a 'Limited Edition' bundle, available "while supplies last", which adds Metal Sonic as a playable character along with his transforming vehicle and Mod Pack, an additional Outrun Bay Track plus challenges and time trials, and stickers for your in-game driver's license. VisualBoyAdvance-M SVN r1163 is compiled. VisualBoyAdvance-M(VBA-M) is a [Super] Game Boy [Color / Advance] emulator for Windows, Linux & Mac. Here you can get information about the latest development build of the Windows version and download it while you're at it. lets commit the right version of the arm patch this time eh. Applied fixes to NormMatts r1150 fixes - V-Rally 3 working again Re-added nasm.props to vs2008 build folder + changes to nasm.rules for spaces in paths. Vba-ReRecording SVN r464 is released. VBA rerecording is the re-recording branch of VisualBoyAdvance. This is the development project for this branch of VBA. Its primary function is to expand features related to the creation of Tool-Assisted movies. DeSmuME SVN r4495 is compiled. DeSmuME is an open source Nintendo DS(NDS) emulator for Linux, Mac OS and Windows. DeSmuME supports save states, the ability to increase the size of the screen and it supports filters to improve image quality. DeSmuME also supports microphone use on Windows and Linux ports, as well as direct video and audio recording. The emulator also features a built-in movie recorder. Fceux SVN r2825 is compiled. FCEUX is a cross platform, NTSC and PAL Famicom/NES emulator that is an evolution of the original FCE Ultra emulator. Over time FCE Ultra had separated into many separate branches. The concept behind FCEUX is to merge elements from FCE Ultra, FCEU rerecording, FCEUXD, FCEUXDSP, and FCEU-mm into a single branch of FCEU. As the X implies, it is an all-encompassing FCEU emulator that gives the best of all worlds for the general player, the ROM-hacking community, and the Tool-Assisted Speedrun Community. My Nes SVN r149 is compiled. My Nes is a portable open source NES/FAMICOM emulator written in C#. It's EXACT nes cycle emulator, very accurate and uses exact ppu scanline timing. My Nes compatibility is very high, and most of the games that supported run perfectly. - Roms browser with bility to disblay additional information of each rom like snapshot and info. - Save/Load state in defferent 9 slots or in file using save/load state as feature. - Sound recorder which record sound of current playing rom in wav format (Mono, 44100 Hz, pcm 16-bit). - Developer console with full access emulation commands. - Support INES (*.nes) file format. - Profiles for control mapping. - CPU :All 6502 opcodes (with the undocumented opcodes), IRQ and NMI. - PPU :8x8 and 8x16 sprites with transparency and priority, background tiles and sprites evulation, internal ntsc palette generator, default PAL palette, Cycle based ppu, real scanline and scancycle timing, Emphasis and monochrome effects. - Sound : all the 5 channels, MMC5, SS5B and VRC6 external sound channels. Format: MONO PCM 16 BIT 44100 Hz. - Mappers : # 0, 1, 2, 3, 4, 5, 6, 7, 8, 9, 10, 11, 12, 13, 15, 16, 17, 18, 19, 21, 22, 23, 24, 25, 26, 32, 33, 34, 40, 41, 42, 43, 44, 45, 46, 47,48, 49, 50, 51, 57, 58, 60, 61, 62, 64, 65, 66, 67, 68, 69, 70, 71, 72, 73, 74, 75, 76, 77, 78, 79, 80, 82, 83, 85, 86, 87, 88, 89, 90, 91, 92, 93, 94, 95, 97, 105, 112, 113, 114, 115, 117, 118, 119, 133, 140, 142,159, 180, 182, 184, 185, 187, 188, 189, 193, 200, 201, 202,203,204,205, 212,213, 225, 226, 228, 229, 230, 231, 232, 233, 240, 241, 242, 243, 244, 245, 246, 248, 249, 251 and 255. Almost full set !! Improved My Nes UI ! RiceVideo Git (2013/02/04) is compiled. RiceVideo is an open source video graphic plugin for N64 emulators. All windows-based emulators with plugin support (1964, Project64, Mupen64plus). Gekko shader-manager Git (2013/02/04) is compiled. Gekko shader-manager Git is a branch of Gekko. Gekko is an open source great Gamecube(NGC) emulator. Gekko is an experimental Nintendo GameCube (NGC) emulator started in 2006 by ShizZy and Lightning. It features a very advanced 32-bit dynamic recompiler and its own OpenGL graphics core, and is capable of booting many commercical titles. Dolphin FIFO-BP Git 3.5-334 is compiled. Dolphin FIFO-BP Git is a branch of Dolphin. Dolphin is the first Gamecube emulator able to run commercial games! Dolphin is a great Gamecube(NGC) and Wii emulator. It has a partial Wii support and plays most Gamecube games. Dolphin has been changed SVN to Git recently. * Used AtomicStore to write to the signal interrupts. * Set the token and finish interrupt signal from the video thread. This fixes the inconsistent state caused by lag from the scheduler. Fixes Rayman 3: Hoodlum Havoc and Shamu's Deep Sea Adventures. * Changed cmdidle to match the isGpuReadingData flag. Fixes the random freezes in The Last Story. Genesis Plus GX SVN r761 is compiled. Genesis Plus GX is a port of Genesis Plus. Genesis Plus GX is an open-source & portable Sega Mega Drive / Genesis emulator, originally developed by Charles MacDonald, now running on the Gamecube and Wii through libogc & devkitpro. Latency issues affecting frame rate and movement fluidity will hold back cloud gaming from making a big impact on the game industry, Satoru Iwata has said. Speaking in a financial briefing Q&A, the Nintendo president said he found it strange that a lot of people see cloud gaming as the future as there are a number of problems it can not overcome. He explained that given the current level of internet technology, there would always be some latency during the process of a server receiving data, producing images instantly and then sending them back, and felt some of these issues were not being communicated to the public. Iwata said that while some games could work through the cloud, such as titles where delays have no effect, he felt that highly interactive games and action titles could not be effectively played through a cloud gaming service. “The term "cloud gaming" is one of the words we have lately heard so often, but I would like people to understand that there are certain things that cloud gaming cannot achieve,” he said. 505 Games has confirmed that Sniper Elite V2 is to make an appearance on Wii U, with the release date set for spring. As you would expect, the game will be tweaked to make use of the Wii U’s feature set, chief of which is the GamePad. Using it players will be able to, amongst other things, tag enemies and booby-traps and monitor the blast radius of explosives without having to access in-game menus. Sniper Elite V2 is already available on Xbox 360 and PS3. Saturo Iwata accepted responsibility for lower than expected international sales of the 3DS. Having already pointed a finger at its international teams for the disappointing performance of Wii U to date, the Nintendo boss also believes that the company has only itself to blame for the handheld’s current performance. “It is obvious that if we are able to sell only about the same number of units of Nintendo 3DS next fiscal year as this fiscal year, the sales growth of software will be limited,” he said. “In such a case, we will probably not be able to reach the level of operating profit we are aiming for. Therefore, the current sales levels of Nintendo 3DS in the overseas markets are not at all satisfactory in regard to the hardware’s potential. “This is not happening due to external factors. The comments are in direct contrast to Iwata’s insistence that low software sales are not of Nintendo’s own making. In the same investor conference, Iwata blamed retail for the failure of a number of potential software hits. However, many onlookers would agree with the notion that Nintendo is at least partly responsible for the plight that it currently faces. The age-old lack of first party software support for its machines, the high retail price of Wii U, high download prices, limited hardware memory and an almost belligerent resistance to step fully into the digital frame are of Nintendo’s making, not the market’s. And what Iwata fails to note, of course, is that Nintendo’s UK team cannot be blamed for the drastically reduced marketing budget it had to play with in 2012. Who knows how the Wii U might have worked out had Japan coughed up. A senior hardware development director at Nintendo has defended the company's choice of CPU for the Wii U. In November, a well-known hardware hacker published what is believed to be the Wii U processor and graphics card specs, revealing that the CPU carries a clock speed of 1.24 GHz.At half the speed of six year-old systems such as the PS3 and Xbox 360, the Wii U's clock speed immediately became the subject of criticisms. However, speaking at a Kyoto investor meeting last week, Nintendo's R&D director Genyo Takeda insisted the hardware did not deserve the negative feedback. According to Takeda the Wii U combines "low power consumption and a fairly high performance". Takeda comments were in response to a question from an audience member who said the processor was weaker than other parts of the device. "Regarding your comment that we focus on the GPU and that the CPU is a little poor, we have a different view," Takeda said. "It depends on how to evaluate a processing unit. 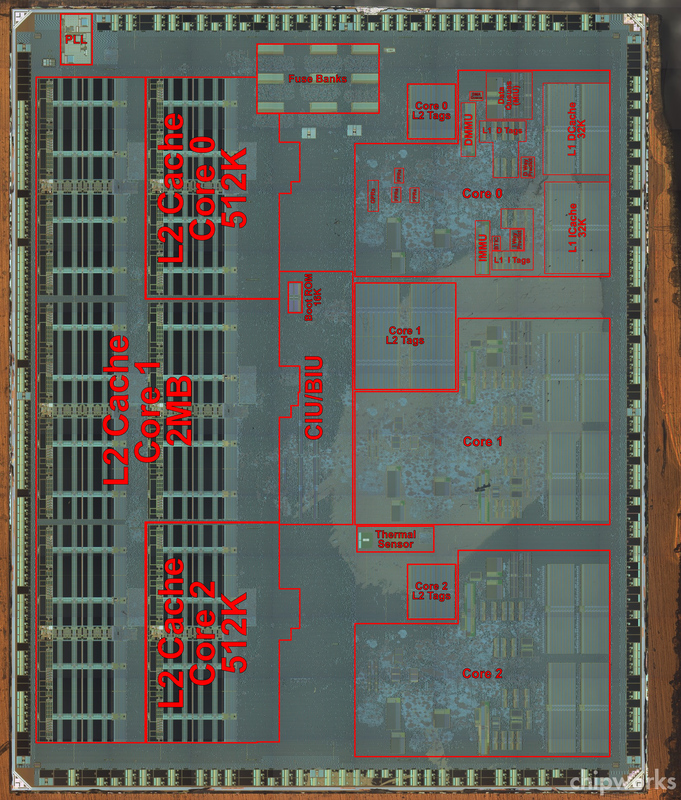 In terms of die size [area a chip occupies], the GPU certainly occupies a much larger space than the CPU. "As you can see CPUs used for the latest PCs and servers, however, it is usual for current CPUs that the logic part for actual calculations is really small and that the cache memory called SRAM around it covers a large area. From this angle, we don't think that the performance of the Wii U's CPU is worse than that of the GPU." Nintendo's choice of CPU was already being scrutinised. Oles Shishkovtsov, the chief technical officer at Metro: Last Light developer 4A, described the Wii U's CPU as "horrible and slow". However, Takeda is claiming that raw CPU speeds are no longer so central to the overall hardware performance. "We have taken a so-called 'memory-intensified' design approach for the Wii U hardware. It is no use saying much about hardware which should remain in the background in our entertainment offerings, but at least we think that Wii U performs pretty well." Nintendo design guru Shigeru Miyamoto recently said it wanted "to immediately communicate the Wii U's value, but could not". According to the father of Mario, the company's development teams are resisting the distraction of the Wii U's disappointing sales performance. Despite its general release two months ago, Nintendo's Wii U console would remain something of a technological mystery. We quickly gained a good idea of the make-up of the IBM tri-core CPU, but the system's apparent strengths are in its graphics hardware, and in that regard we had little or no idea of the composition of the Radeon core. Indeed, it's safe to say that we knew much more about the graphics processors in the next-generation Xbox and PlayStation. Until now.Detailed polysilicon die photography of the Wii U's GPU has now been released, showing the hardware make-up at the nano level and resolving most of the outstanding mysteries. 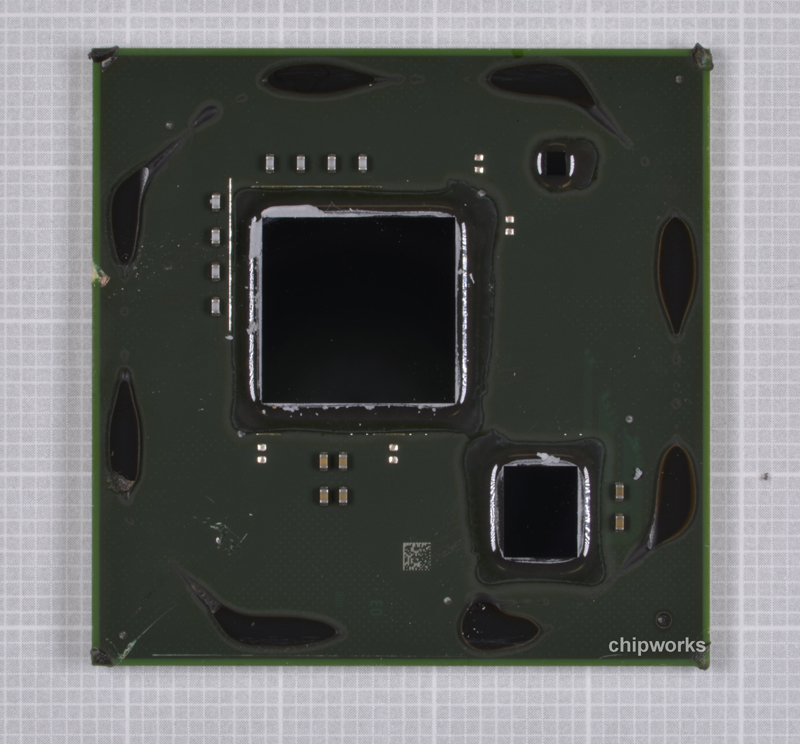 However, the story of how these photos came into existence is a fascinating tale in itself: community forum NeoGAF noticed that Chipworks were selling Wii U reverse-engineering photography on its website, with shots of the principal silicon being offered at $200 a pop. Seeking to draw a line under the controversy surrounding the Nintendo hardware, a collection was started to buy the photos.There was just one problem. The shots were simply higher quality versions of what had already been revealed on sites like Anandtech - good for getting an idea of the amount of silicon used and the make-up of the overall design, but without the ultra-magnification required to provide answers, and therefore no further use in unearthing the secrets of the Wii U hardware. At this point, Chipworks itself became aware of the community money-raising effort, and decided to help out by providing the required shot - for free. It's a remarkably generous gesture bearing in mind that the cost of carrying out this work is, as Chipworks' Rob Williamson told us, "non-trivial". "Sourcing the images required to nail down the make-up of the Wii U GPU was the result of a remarkable community effort, plus the generosity of reverse engineering specialists, Chipworks." The NeoGAF community started a collection to buy Chipworks' reverse-engineering photos of the Wii processors, but alas the existing photography wouldn't have told us anything new. On the left we see the markings on the heatspreader while on the right we see the metal shield removed and the GPU and CPU revealed. So, what does the new shot below actually tell us? Well, first of all, let's be clear about how we draw our conclusions. Graphics cores work principally by spreading work in parallel over a vast array of processors. On the die shot, this manifests as the same mini-blocks of transistors "copied and pasted" next to one another. We know that the Wii U hardware is based on AMD's RV770 line of processors - essentially the Radeon HD 4xxx cards - so we have some point of comparison with existing photography of equivalent AMD hardware.Chipworks' shot is still being analysed, but the core fundamentals are now seemingly beyond doubt. The Wii U GPU core features 320 stream processors married up with 16texture mapping units and featuring 8 ROPs. After the Wii U's initial reveal at E3 2011, our take on the hardware was more reserved than most. "We reckon it probably has more in common with the Radeon HD 4650/4670 as opposed to anything more exotic," we said at the time. "The 320 stream processors on those chips would have more than enough power to support 360 and PS3 level visuals, especially in a closed-box system. "It was ballpark speculation at the time based on what we had eyeballed at the event, but the final GPU is indeed a close match to the 4650/4670, albeit with a deficit in the number of texture-mapping units and a lower clock speed - 550MHz. AMD's RV770 hardware is well documented so with these numbers we can now, categorically, finally rule out any next-gen pretensions for the Wii U - the GCN hardware in Durango and Orbis is in a completely different league. However, the 16 TMUs at 550MHz and texture cache improvements found in RV770 do elevate the capabilities of this hardware beyond the Xenos GPU in the Xbox 360 - 1.5 times the raw shader power sounds about right. 1080p resolution is around 2.5x that of 720p, so bearing in mind the inclusion of just eight ROPs, it's highly unlikely that we'll be seeing any complex 3D titles running at 1080p.All of which may lead some to wonder quite why many of the Wii U ports disappoint - especially Black Ops 2, which appears to have been derived from the Xbox 360 version, running more slowly even at the same 880x720 sub-hd resolution. The answer comes from a mixture of known and unknown variables. Wii U "can rule out any next-gen pretentions"
A detailed look at the until now mysterious innards of the Wii U suggests that Nintendo’s machine will be eclipsed by the upcoming PS4 and Xbox 720. The tech heads at Digital Foundry have examined the results of a detailed teardown of the Wii U hardware. The result is a machine that “is in a completely different league” to the upcoming hardware from Sony and Microsoft. Indeed, the site goes as far as to say that the results “finally rule out any next-gen pretensions for the Wii U”. It adds that while Wii U out-specs current machines like the Xbox 360 in some respects (it has 1.5x the “raw shader power”, apparently), it foresees few titles being able to squeeze out complex 3D processing in 1080p. Also examined is the fact that multiplatform titles such as Call of Duty: Black Ops II tend to run worse on Wii U than the likes of Xbox 360, despite the seeming power advantage enjoyed by Nintendo’s console. DF reckons Wii U’s 1.2GHz CPU is the likely culprit, which itself is a re-working of a chip seen in the Wii – which itself was an overclocked version of a GameCube processor! Namco Bandai will launch Mario Kart Arcade GP DX this summer. So far all the company's shown of the third Mario Kart arcade game is a handful of screenshots, but these at least reveal that gliding and underwater driving (as featured inMario Kart 7 on 3DS) will feature.As well as the Grand Prix and four-player race modes offered in the previous arcade releases, it will feature a new "Alter-Ego" mode which uses ghost racers retrieved online. It's been confirmed that Don-chan, the main character from Namco's popular drum-based rhythm action game Taiko no Tatsujin, will be a playable character. There will also be a new track based on the Taiko no Tatsujin world. This is nothing new for a Mario Kart Arcade GP game - previous entries in the series have also featured Namco Bandai characters, including Pac Man and Mametchi from Tamagotchi. Future Shop lists a limited edition Wii U 32GB ZombiU bundle, going for $400 with a copy of ZombiU and Wii U Pro Controller included. The bundle has an estimated release date of February 17 and is available for pre-order now, while supplies last. FutureShop says there are only 95 of these bad boys, so if you want one act fast. Pretend a zombie is chasing you or something. 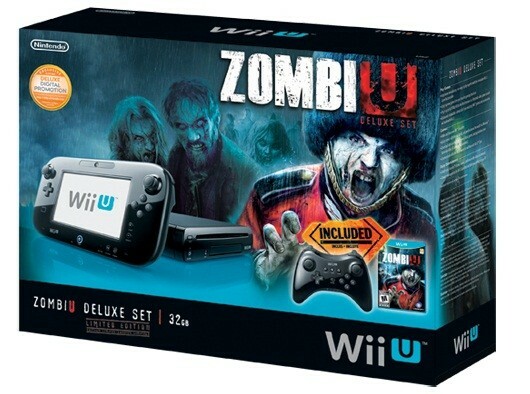 Though Future Shop is a division of Best Buy, there's no word if the ZombiU Wii U bundles will make their way to the US or other territories. The Wii U GamePad includes a near-field communication function, but you wouldn't know it if you didn't, say, read obsessively about game consoles on the Internet. At the moment, no Wii U game uses it for anything, not even Skylanders, which ships with its own NFC reader. Speaking to investors, CEO Satoru Iwata discussed potential plans for the tech, none of which have been finalized. Nintendo's ideas for NFC uses split in two directions: Skylanders-style toys and credit card reading. "For example, we can create cards and figurines with NFC and design our video games to work in conjunction with them," Iwata said of the first possibility. "Also, an increasing number of arcade games are utilizing IC cards which can read and write data in order to record users' scores and it is possible for Wii U games to connect with them." Nintendo is working with "several" developers on ideas like this, "and, by the end of this year, we will probably be able to show you some output, tell you about some more concrete examples of the possibilities or even let you try out some tangible examples." The other potential use of NFC, as discussed by Nintendo before, is for payment cards. "Technically, it is possible to settle an account by waving an e-money card over the Wii U GamePad," Iwata said. "We are conducting research into this right now as one of this technology's future possibilities." While NFC payments are more prevalent in Japan than elsewhere, there are lots of credit cards in America that can be used by tapping on the card reader. Setting your card down on the GamePad would certainly be more convenient than entering a number. Whatever Nintendo does with the technology, Iwata is adamant that it had better do something. "Since we have made a certain investment in order to install NFC," he said, "we will make efforts to at least receive a return on our investment." The Wii U’s slow start on the market can be attributed to the difficulty of conveying its features to the public. That’s the opinion of Xavier Poix, the MD of Ubisoft’s Annecy, Montpellier, and Paris studios who also admitted that Ubisoft made mistakes with Wii U launch title ZombiU. "The depth of what you can do with that console is really hard to get across unless you play with it," Poix toldGameSpot. "It's different from the Wii, where seeing was believing. With the Wii U, people really need to experience it. "The whole idea of the asymmetrical gameplay and using two screens to do two very different things is not simple to explain to people. 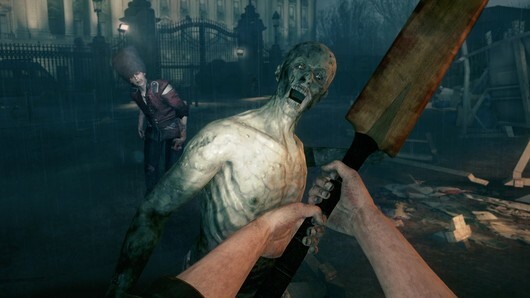 ZombiU was designed to be a game for core players launching with a new Nintendo console. “We should have communicated better in this respect to let people know what kind of experience to expect. It wasn't obvious enough that there would be a new controller and new gameplay and a new skill set to develop." Nintendo has outlined plans to release new download content for Pokémon Mystery Dungeon: Gates to Infinity "on a regular basis" from launch. The download content will range from new Mystery Dungeons to explore, new items to collect and new Pokémon to interact with.Four downloadable mystery dungeons will be available when the game launches in US on March 24, one of which, the Poké Forest Mystery Dungeon, will be free to download from launch day until April 30. Nintendo says it will follow up with additional content to "launch regularly throughout April". A new trailer offering a peek at the DLC is below. As series fans will know, Mystery Dungeon offers up randomly generated dungeons, with items and power ups that'll change location each time a player enters them. Pokémon, items and treasure within a Mystery Dungeon will change location every time a player re-enters. Gates to Infinity will include wireless multiplayer for up to four players in a 'Companion mode' alongside the single-player 'Hero mode', and StreetPass features. Nintendo has released the official list of new digital content for its various platforms this week. Fist of the North Star: Ken's Rage 2 - Fist of the North Star: Ken's Rage 2 is a collaboration between the popular manga Fist of the North Star and the action-packed Warriors video game series. With the majority of the episodes from the original manga intact, the game faithfully re-creates their legendary martial arts and the battles between these captivating characters. Brain Age: Concentration Training - Brain Age is back with new devilishly difficult brain-training exercises designed by world-famous brain researcher Dr. Ryuta Kawashima. Brain Age: Concentration Training introduces newly designed training exercises that challenge players with activities to help refine their concentration skills and the ability to access their short-term memory. Players can spend five minutes a day with the game to help better their focus and attention skills. Brain Age: Concentration Training will be available in the Nintendo eShop and in retail stores on Feb. 10. Etrian OdysseyIV: Legends of the Titan - Demo Version - Etrian Odyssey IV is the newest addition to the beloved franchise, and brings with it an enhanced graphics engine boasting polygonal enemies and new 3D special effects. The game also features upgradable, customizable skyships that let players travel and battle amid the clouds, a fully orchestrated musical score from Yuzo Koshiro and expanded, immersive 3D dungeons with analog camera control. Pro Evolution Soccer 2013 3D - Pro Evolution Soccer 2013 3D returns to the roots of the sport with unique levels of control and a major emphasis on the individual style of the world's best players. Thanks to feedback from dedicated fans, PES2013 offers full control over shooting and first touch. Endorsed by famous soccer players Cristiano Ronaldo and Neymar, Pro Evolution Soccer will continue to push boundaries and capture the essence of teamwork. Pro Evolution Soccer 2013 3D is now available at retail stores and will be available in the Nintendo eShop on Feb. 12. Nintendo has limited the ability for younger Wii U gamers to send friend requests through Miiverse.The rule affects users aged 12 and under, and was quietly announced in a recent update to the social network.Nintendo explained it had reached the decision in a bid to protect younger users. "For the protection of younger users, direct friend requests are not possible in Miiverse for users aged 12 and under," reads a new section of the console's Miiverse Code of Conduct (spotted first by Aussie-Gamer). Nintendo closely moderates Miiverse posts and removes any offensive text or line drawings. "At the same time, younger users can make friends on Wii U outside Miiverse by entering each other's Network IDs in the friend list on the HOME menu. "It means that users under 13 can still befriend others, although not exchange messages with them through Miiverse. "We encourage younger users to make friends on Wii U only if they are friends in real life (such as friends from the same school or neighbourhood). Therefore, do not attempt to exchange your Nintendo Network ID with other users on Miiverse. "Other changes include a five-minute posting limit on Miiverse communities (you'll still be able to comment on existing posts) and stricter notification controls (you'll now only be notified if the original poster responds to your comment, rather than any user).Eurogamer has asked Nintendo for comment on the changes. We'll update when we hear back. Activision’s CEO has stated his concerns over the Wii U launch and its installed base, following the publisher’s record set of financial results last night.Speaking on the subject of Skylanders’ peformance on the console, Activision CEO Bobby Kotick said: “We were somewhat disappointed with the launch of the Wii U, and I think it’s a challenging environment this year. And one of the things we are concerned about is what the installed base of hardware will be like for 6- to 11-year-olds. But we have a lot of confidence in the [Skylanders] franchise for the long-term. I think we’re delivering another great product this year.”He added that he remained enthusiastic on the future of the Skylanders franchise overall, as it helped Activision to post record financial results for the past quarter and calendar year. Activision also noted that, rather unsurprisingly, a new Call of Duty game is due for 2013 and that development continues on its project with Bungie, Destiny. You can read more about Destiny and Bungie here in our exclusive studio profile. Wii U software sales accounted for just 1.6 per cent of the UK retail market in January, with just 34,000 units sold. According to data published on NeoGaf, that puts Nintendo's struggling platform below the PlayStation Vita - which had 2.2 per cent of the market - in terms of sales volume, and 8th out of the 10 platforms covered by the data. The information is consistent with GamesIndustry International's record of the software charts for January. The Wii U has failed to register a software exclusive in the top 20 games for the entire month, despite relatively low sales across the board. By contrast, the Wii had two games in the top 10 during the equivalent period. A report published by Eurogamer at the end of January collated more sales information that lends credence to the leaked data: the Wii U's launch weekend hardware sales in the UK comprised more than 50 per cent of its total after 5 weeks - a significant loss of momentum that pointed towards only 80,000 units sold by the end of January, less than any console from the previous generation. And the sense that Nintendo's new console has failed to make the desired impact is building all the time. Yesterday, in Activision's conference call, Bobby Kotick highlighted the "somewhat disappointing" launch of the Wii U as a black mark on Skylanders' otherwise bright future. The Wii U also lost two exclusives today: Tecmo Koei's Ninja Gaiden 3: Razor's Edge and and Ubisoft Montpellier's Rayman Legends will now both receive PlayStation 3 and Xbox 360 versions. 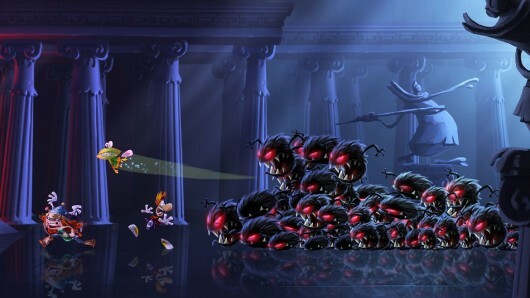 In the case of Rayman, the decision was abrupt enough to elicit a damning response. GamesIndustry International approached Chart Track to confirm the data's accuracy, but it declined on the grounds that any confirmation would "fan the flames" of the consumer reaction. The Wii U's launch was a bit rocky, to say the least. Missing features, promised TV services and slow-loading, day-one firmware updates left Nintendo fans frustrated and disappointed. The company is still cleaning up the mess too, announcing that it will push two additional software updates to fix the console's slogging load times. A quicker console will certainly be welcome, but the Wii U spring updates are missing an opportunity to close a rift that divides Nintendo from its loving customer base: how it handles digital content ownership. Ever buy an Xbox Live game? You probably know that purchase is tied to your Xbox Live account, and will be available on any subsequent Xbox you purchase. Not in Nintendo's world; Kyoto's digital sales are tied to the gaming hardware, not the user's account. It's been a soft spot for Nintendo gamers for some time now, and the Wii U was the company's chance to make amends -- except it didn't. Like its predecessors, the new console locks content to the device it was originally purchased on, imprisoning digital purchases in a physical cage. The Wii U takes content confinement a step further with its support for legacy software, providing a near-perfect example of the folly of Nintendo's content ownership philosophy: the isolated sandbox of its backwards-compatible Wii Menu. This week we return to the N64 Magazine series with issue 6. We start of with one of several features in this magazine, calledCome forth RPG's, which also includes a look at the work in progress on the never to be releasedMother 3on the N64. Then we jump back and take a look at the previous generation with the feature calledAntiques Codeshow. Up next we have a deeper look intoSpace Station Silicon Valley, and we end with the review forWayne Grezky's 3D Hockey. The NES emulator My Nes has been updated. * Added MLV library for ListView instead of normal listview. * Added ability to manage columns of the listview. * Added welcome window which get shown at the program startup and give ability to play recent game or recent save state. * Added INES format file header editor. * Added INES files fixer tool. * Added ability to rate each game. * Added ability to store additional info for each rom in the beowser. * Added zapper support to SDL .Net renderer. * Added playd times counter which count play times of a game. * Imporved: you can open rom information of a rom even that rom is not on emulation. * Fixed: a lot of bugs. it is "Guillot'NDS", a game of reflexes minimalist but difficult. The first model of the NES wasn’t all that great; just ask any one of the millions of six-year-olds who independently discovered blowing on a cartridge made it work. The second NES hardware revision, the top loader, was better but only had RF video output. These are the only two pieces of hardware that can play every single NES game, and even with years of hacking NES-on-a-chip devices, there’s still much to be desired. [low_budget] over on the AtariAge forum decided he’d had enough of these hardware compromises and decided to build the first new NES hardware revision in 20 years. It’s got all the best features from both of its predecessors and a few new features not seen on any existing NES. There’s support for composite and RGB video generators, new and better amplifiers for the audio, no lockout chip, and a top loading cartridge slot to prevent bent pins on the 72 pin connector. While [low_budget]‘s prototype works, it only does so by salvaging the CPU and PPU from a working NES. There’s still much work to be done on the prototype, but even if we’ll have to destroy our beloved NES, we’d love to get our hands on one of these improved consoles. Nintendo has revealed plans to release a new Wii U hardware bundle for ZombiU in North America and Canada on February 17. The hefty bundle will include a black Wii U Deluxe console, the ZombiU game, a black Wii U Pro Controller and a collectible booklet featuring artwork from the game and never-before-seen developer commentary. It'll also come with a download code for Nintendo Land, redeemable via the digital Wii U eShop.The ZombiU bundle will hit retail for $389.99 - $40 more than the standard Wii U Deluxe Set (which only includes the console and Nintendo Land). Nintendo says it represents a $70 saving on purchasing all the contained content separately. Due to the inclusion of a Deluxe Wii U, buyers of the new bundle will also be enrolled in the Digital Deluxe Promotion, a program that allows Wii U owners to receive a 10 percent rebate in points for each download they purchase in the Nintendo eShop. Forget that there has been a Rayman Legends demo on the Wii U for over a month now – it's old hat. Ubisoft is planning on releasing another demo, this one exclusive to Wii U. Ubisoft announced the exclusive Wii U demo as a sort of consolation prize to upset fans complaining about the delay and multi-platform announcement. "Thanks for all your feedback regarding Rayman Legends in all of its forms. We have heard you and we will continue to listen," Ubisoft wrote on its Facebook page. "We understand your frustration and that you want to get your hands on the game. 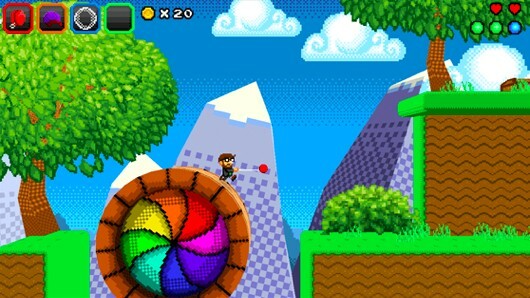 We are working with the development team to provide you with a new, exclusive demo for the Wii U soon. Stay tuned for more." Rayman Legends was originally announced to be a Wii U exclusive back in August, though obviously that plan has changed. This is the second delay forRayman Legends, which was originally penciled in for the Wii U launch. When Monster Hunter 3 Ultimate comes out in March, you'll have no help online from the Japanese players who will have been practicing for months. The servers for online multiplayer in the Wii U action RPG are region locked, according to a GameReactor interview conducted with producer Ryozo Tsujimoto. "In principle, the online game in Europe is only among Europeans," Tsujimoto said. Capcom clarified to the site that the region lock keeps North America, Europe, and Japan sequestered to their own regions. Capcom community specialist Yuri Lindbergh responded to US fans, pledging to pass along fans' universal displeasure to Capcom. I’ve been a longtime fan of Brain Age. Mixed in among the standard-issue kill-everything-you-see/race/sports types of games that dominate gaming, Brain Age on the Nintendo DS always provided something unique, fun, and mentally stimulating. Doing math problems, counting syllables, recognizing patterns, and memorizing stuff was far more enjoyable than anyone would have expected in Brain Age: Train Your Brain in Minutes a Day, the game that kicked off the series seven years ago. Based on the research of neuroscientist Ryuta Kawashima, the exercises are designed to improve brain function—or at least give players the illusion that they’re getting smarter. Nintendo developed several sequels and spinoffs for the DS after that first game, and now a Nintendo 3DS-exclusive entry is here with Brain Age: Concentration Training, released as a download and physical media this past weekend for $30. Some improvements in gameplay are readily apparent. Handwriting recognition is significantly better. You play the game by holding the 3DS upright, rather than sideways like a book, and it works so well I wonder why previous Brain Age games used the wacky book-like layout at all. "Read below to see what Jon thinks of the 3DS-exclusive version. 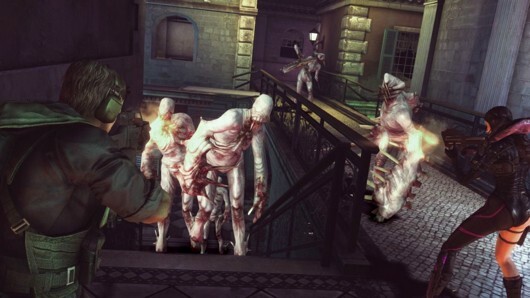 The Wii U version of Resident Evil: Revelations will make use of the platform's unique hardware, allowing the full game to be played on the GamePad. The latest issue of the Official Nintendo Magazine reveals this tidbit, according toNintendo Insider. The issue is due on UK newsstands in two days. The port also features Wii U Pro Controller support, and GamePad touchscreen-based inventory management. In ONM's interview, producer Tsukasa Takenaka says "There's a joke going around in Japan at the moment about using Off TV Play to play your Wii U games on the Bullet Train, as long as you get on of the seats with a power outlet, so we wanted to make sure Bullet Train play was possible with Revelations." Revelations is also coming out on PS3, Xbox, and PC; those won't have off-TV play for obvious reasons. It was originally released on 3DS, where it only had off-TV play. The NES emulator HalfNES has been updated. Rice Video a Nintendo 64 Graphics Plug-In has been updated. Swiss SVN r199 is compiled. The swiss army knife of gamecube homebrew. Swiss aims to be the ultimate utility Gamecube homebrew application. FBZX-Wii v80 is released. Port of ZX Spectrum emulator FBZX to Wii. FBZX is a Sinclair Spectrum emulator, designed to work at full screen using the FrameBuffer or under X-Windows. DeSmuME Wii SVN r251 is compiled. DeSmuME Wii is a port of the Nintendo DS emulator DeSmuME to Wii homebrew. This project aims to port DeSmuME to Wii homebrew so that we can have a fully fledged, working, Nintendo DS emulator on Wii. It is being built with DeSmuME 0.95 and the latest available devkitPPC and libogc releases. Shane (sper56@gmail.com) pointed out this blunder. Oops! Nintendo has made good on its promise to broaden its digital software offer by making Namco Bandai’s Tank! Tank! Tank! Free-to-play. The game has failed to perform commercially, not least because of the critical mauling that saw it win a Metacritic average of just 45 per cent. Gamers are now able to download a free ‘basic’ pack that includes three games modes – Monster Battle, Free-For-All and Team Versus. Players will be limited to three sessions of each mode for free every day. Players can then, if they choose, pay an addition fee on up to ten pieces of DLC that will offer extra levels and modes. Purchasing any of these will also remove the gameplay restrictions. For the time being these cost only £1.59 per pack, although the price will at some stage increase to £7.99. Nintendo has announced Pokémon Rumble U, a downloadable game for the Wii U eShop.It's the third in the Rumble series of spin-offs featuring animated Pokémon toys. The game's existence was revealed in Japanese magazine CoroCoro (thanks,Serebii), scans of which have found their way online.Rumble U will feature all current Pokémon species (649, until the launch of this autumn's Pokémon X and Y), with up to 100 critters on screen at any time.Nintendo of Europe has yet to announce the game. There's no release date for Japan yet, either.In other Pokémon news, Nintendo has begun to open up its huge archive of Pokémon anime episodes via a new iOS and Android app.Pokémon TV, now available from iTunes and Google Play, currently features around 50 episodes from each generation of the show to watch. Episodes will presumably be rotated, and even movies will be shown. The pink and white 3DS XL was released in North America over the holidays as a limited edition, first sold online, then briefly through retailers. 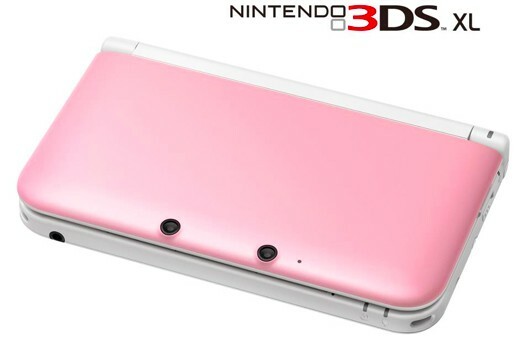 Just in time for Valentine's Day, when the color pink overruns stores nationwide, Nintendo is bringing the pink 3DS XL back. According to a post on the company's Facebook page, it'l be out this week "at stores coast to coast." It would probably look really nice with a bouquet of roses. Just saying. Nintendo has announced plans to broadcast a Nintendo Direct 3DS event tomorrow. Providing updates on 3DS games "coming soon as well as in the future", it will be streamed on the Nintendo Direct website from 2pm GMT on February 14.The platform holder's most recent Nintendo Direct press conference was jam-packed with exciting Wii U news including plans to show off a new 3D Mario title and Mario Kart Wii U for the first time at E3 in June. While 3DS hardware sales continue to track ahead of those of its predecessor at a similar point in its lifetime, Nintendo said last month that the almost two-year-old platform is struggling to achieve the desired impact outside of its home nation of Japan, largely due to a lack of hit games. President Satoru Iwata went on to outline the firm's intention to boost the range of first and third-party software available for the system in a bid to combat the lack of penetration in western markets and transform 3DS from a "device just to play the Mario series [on]". While the executive felt that many western third-party studios are focused on making games for home consoles, he said "Japanese software developers are eagerly assigning their top teams to develop key titles for Nintendo 3DS. We therefore plan to more actively support the Japanese software developers in distributing their key titles overseas this year. We are also willing to flexibly assist third-party developers in distributing their valuable games overseas." Former 3DS exclusive Resident Evil: Revelations may be coming to consoles, but the Wii U version is currently not slated to include Resi 4's brilliant Wiimote controls, according to Capcom. "Unfortunately Revs is only supported by the Wii-U gamepad at the moment. We're doing what we can to get the new classic controller compatibility, but the game's not setup to track motions from the Wii-remote at this time," wrote Capcom marketing man Mikeeb on thepublisher's forum.This may come as a blow to many as the Wiimote controls in Resi 4 - in which you pointed at the screen to aim and used the analogue stick to alter your field of view - were incredibly efficient, even if it did have a somewhat awkward learning curve. Revelations, however, allowed players to move and shoot at the same time if played with either the Circle Pad Pro or gyro controls, so ostensibly this dual-analogue move-and-shoot setup will be retained on platforms with more than one analogue stick, but we've checked with Capcom to confirm this and are awaiting reply. There's a little corner of Cardiff that's forever Kyoto. Here, in spitting distance of Cardiff University and within the sprawling student district of the Welsh capital, lies Dakko Dakko, a little cauldron of colour hidden in an otherwise drab office block. Leave your shoes at the doors and you enter a small, busy space, decorated with bright tatami and candy-pastel Mario toys.And at the far corner you'll find Rhodri Broadbent, a man whose heart's been touched by the Japanese city. He's had a fascinating career, has Broadbent - having worked at Lionhead on the first Fable, the Welsh developer moved out there to join Q-Games, where he got to meet Shigeru Miyamoto while working on Star Fox Command. "It was possibly the most embarrassing moment in my life," blushes Broadbent. "Because everyone knew that I was a Nintendo fan - well, everyone was a Nintendo fan at Q, but there was a focus on me. "And then the producer says to Miyamoto 'I asked Rhod why he moved to Kyoto, and he says it's because of Nintendo'. Everyone started laughing, Miyamoto did his humble thing - and I just collapsed in my chair. I crumpled up into a ball, and then realised I was crumpling into a ball in front of Miyamoto. That must have been strange for him. "Broadbent's more than a Nintendo fanboy, though. In his life post Q-Games he's set up his own outfit, Dakko Dakko, a studio responsible for a brace of games whose titles are as long-winded as their play is simple: The 2D Adventures of Rotating Octopus Character was a well-defined PlayStation Mini, the follow-up Floating Cloud God Saves the Pilgrims an undisputed highlight of Sony's humble service. "Towards the end of Cloud God we started to get a bit more ambitious," explains Broadbent. "We thought we can't just keep doing the same development cycle, so we'll have to do something that takes a bit longer." And so Broadbent followed his heart. "I just shot off an email to Nintendo - which was a bit blasé - but they said yeah, you can come and develop for our platform." [h=2]The Nintendo difference[/h]When it comes to big console companies embracing indies, Broadbent's got a clear-minded view. "Mid-tier developers have had a hard time the last few years, so they need to start fostering the smaller ones to become the new mid-tier - and to recreate the games industry - if they want to have a games console industry." So what's Nintendo's support like compared to Sony's, a company that's famously good when it comes to dealing with smaller developers? "I wasn't expecting it to be there in the same way that it was with Sony, and it turns out that it is there. Sony's forums are slightly more advanced, and more busy, but the general feeling is that Nintendo's at the same level. Mostly it's in game design - they're intrigued and interested in what you're bringing to the platform, and they have interesting questions. With us they've been very involved and interested in what we're doing." Rhodri Broadbent and his octopus friend. A brilliantly bold move, and it's one that paid off. A meeting was set at GDC last year, the scheduled ten minute chat blossoming into over an hour of shared enthusiasm, and what was once a 3DS project evolving into an all-new game for Nintendo's Wii U. "Yeah, that was a good day," deadpans Broadbent.Aligning itself with the Wii U has meant that Dakko Dakko has had to scale up its operation, moving away from the living room that birthed its first two games and into an office space with room for new recruits. Like Broadbent, they're a bunch with an impeccable track record - Dan Croucher of Relentless joins the team, as does Soul Bubbles and Perfect Cell programmer Thomas Volbrecht, while Gary Lucken of Army of Trolls fame, the creator of some astounding pixel art who lent his talents to Floating Cloud God, returns. At the recently held Datastorm 2013 demoparty, Genesis Project released a short but fine Gameboy classic demo named DMG*P-01. The music could have need a bit more pressure, but is okay overall. Two nice graphics are shown, which should at least convince you to spend time with the YouTube video. Donkey Kong’s coming to 3DS in the form of a refitted version of 2010 Wii game Donkey Kong Country Returns.According to Satoru Iwata, who revealed the game during today’s Nintendo Direct, Donkey Kong Country Returns 3D has been “rebuilt from the ground up for 3DS” – though details on exactly what that means beyond 3D graphics were scant. It is, however, the first time Donkey Kong has fronted a game on Nintendo’s latest handheld. Nintendo has confirmed that Animal Crossing: New Leaf will be released in Europe on 3DS on June 14th.The news came in today’s 3DS-focused Nintendo Direct presentation. New Leaf has been on sale in Japan since last year, and was the second-biggest selling title in the territory for 2012. In a Nintendo Direct today, Satoru Iwata revealed a new adventure starring Mario’s taller, greener brother. New Super Luigi U is due later this year and to be distributed as DLC for NSMBU.Iwata described the project as being similar in scale to a regular game, and explained that it will change the game’s existing course into new ones, taking Mario out of the picture in the process. Last month, Nintendo blitzed Wii U owners with new game announcements to spark interest in the middle of a post-launch release drought. Today the company turned its attention to the handheld space with a Nintendo Direct presentation focused primarily on the 3DS and new games featuring two of its biggest icons, Mario and Donkey Kong. Leading up the push was a pair of games set for launch this summer: the light-hearted roleplaying game Mario & Luigi: Dream Team and the latest in the Camelot-developed sports series Mario Golf: World Tour. The 3DS will also be seeing Donkey Kong Country Returns 3D, a version of Retro Studios' 2010 Wii game revamped to take advantage of the handheld's glasses-free 3D feature. Nintendo also announced the downloadable action-puzzle game Mario and Donkey Kong Minis on the Move for the 3DS' eShop. In other 3DS news, Nintendo confirmed Luigi's Mansion: Dark Moon and Animal Crossing: New Leaf launches on March 24 and June 9, respectively. Additionally, Pokemon developer GameFreak's downloadable rhythm-based action game HarmoKnight was set for a March 28 debut. 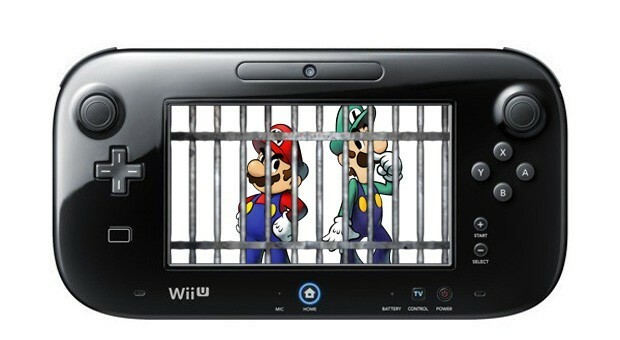 While the 3DS was the primary focus of the event, Nintendo dropped some news for the Wii U as well. The company revealed a new North American Wii U bundle set for release this Sunday. The new set will feature everything from the current $350 Wii U Deluxe bundle, as well as Zombi U, a black Wii U Pro Controller, and an art book for $390. As for games, Nintendo announced New Super Luigi U, a large-scale downloadable content package for New Super Mario Bros. U that will feature the green-clad Mario brother jumping and stomping his way through 80 remixed levels from the original game. ED64 plus is a Game Cartridge emulator for your N64 Console. It allows you to play your favourite backup game on your N64 console via ED64 plus. * The ED64Plus cart require a commercial N64 game cartridge with CIC6102 to be plugged into it as a dongle for the CIC microchip protection check. ** The ED64Plus launch a ROM with corresponding save type automatically. All save types are fully supported. However, the ED64Plus menu allows changing of the save type prior to launching a ROM. This is done by pressing the L/R buttons to cycle through the different cartridge save types. When game is playing, press Reset button will take the user back to the ED64Plus menu, and the ED64Plus automatically creates a save file on the inserted SDCard within the /ED64P/SAVE folder. Each save game will have an extension corresponding to what type of save it is. Over at the ChronoCrash Forums, Magggas has released a new Beats of Rage Mod that should work OK on Dreamcast, PSP, Xbox, Wii and the Open Source Consoles such as Dingoo, GP2X Etc. "moves_list.txt" or the "How to play" screen. The return of the format wars; What next for Wii U? In times of uncertainty on the High Street, it’s reassuring to feel some of that old-fashioned friction that only the games market can provide. Yep, the Format Wars are back. With Sony offering a ‘glimpse at the future of PlayStation’ (aka the PS4 announcement) next week, the reinvigorated UK Xbox exec team this week spared no opportunity to underline just how comprehensively they thrashed PlayStation 3 in this current generation. Warning shos fired. And Wii’s record-breaking run is next on their hit list. You can read the in-depth interview starting on page 16 – there’s some great insight in there. But read between the lines in what Jon Grimes and Harvey Eagle say and, although they never utter a word about a new console, it’s apparent that Microsoft has been building its next-gen strategy in plain view for some time. Xbox Live and cloud storage, underappreciated innovations like Sesame Street TV, that catch-all games/movies/TV/music phrase ‘Xbox is an entertainment brand’… even the idea of hardware via subscription. Microsoft is saying nothing about next-gen, but the message is loud and clear: it won’t take whatever Sony’s got lying down. Comments from retailers big and small about Wii U pretty much read like a greatest hits of complaints. Now That’s What I Call Concerns About Nintendo’s Strategy, Volume 2. Look at these suggestions from Nintendo’s POV, and I think retailers might have to be prepared for them to fall on deaf ears at first. Of course Nintendo knows that Wii U has struggled, and not through lack of trying by its passionate staff or support from fans. Nintendo might be able to swing to a price cut. But it can’t exactly force developers it doesn’t employ to make games. It can’t make consumers dip into their savings. And it cannot (although fanboys would tell you otherwise) magically change the seasons and just make it all better. The fear, of course, is that this clever console gets washed aside in the excitement for boxes that still don’t officially exist – and which might not even arrive this side of Christmas. That’d be an unfair fate for the follow-up to what really was a revolution in video games just a few years ago. That’s where you can empathise with retail, who are seeing first hand just how tough it is out there right now, and are begging for some help. UK games retailers want Nintendo to revitalise Wii U sales with a fresh marketing push and a price drop. Console sales have slowed since its December launch. Last week, it lost exclusive rights to Rayman Legends andNinja Gaiden 3, and Activision boss Bobby Kotick said the publisher is “disappointed” in Wii U’s performance so far. In January, Wii U’s second month on sale, the console only accounted 1.6 per cent of UK game sales. In the US, Wii U has sold 38 per cent less units than its predecessor at the same stage of its own launch. But retailers, including members of MCV's Retail Advisory Board, have said they believe Nintendo can turn this around if the platform holder acts now. “Wii U has not caught the public’s imagination yet,” Tesco games buying manager Jonathan Hayes told MCV. Indies believe a price drop would lift the Wii U, but warn that it cannot be the only solution. “A price drop on the console or extremely competitive bundle options to encourage consumer take-up would be ideal,” said Grainger Gamers’ commercial director Simon Peck. Publisher support is a more divisive subject among stores, with debate about which companies will produce the biggest system-sellers. “Third-party support will be vital over the coming months, especially as triple-A Nintendo launches are so infrequent,” said Games Centre MD Robert Lindsay. A full analysis of retail demands for Wii U will be in next week’s issue of MCV, available on Thursday, February 21st. The Xbox 360 has started 2013 in much the same way as it ended 2012 in the US. And sadly, so did the Wii U.
NPD’s numbers for January 13 actually show a rare thing for the US games market – year-on-year gains. Nine per cent, in fact. However, as Gamasutra points out, the way the days fall means that January this year had an extra week compared to in 2012. Once adjusted the numbers show an estimated 13 per cent annual decline, falling from $765.6m to $667.8m. The site also spoke to an NPD who confirmed that sales of Nintendo’s Wii U are currently tracking 38 per cent behind those posted by the Wii at the same stage in its life cycle. A source told the site that sales of the machine in January were “well under” 100,000 units, whereas Gamasutra itself pins hardware unit sales at “somewhere between 45,000 and 59,000 units for the month” which is “lower than any of the three previous-generation home consoles sold in their worst months”. Activision’s Call of Duty: Black Ops II was the best selling game of the month followed by Ubisoft’s Far Cry 3 (2nd) and Just Dance 4 (3rd), 2K Sports’ NBA 2K13 (4th), EA’s Madden NFL 13 (5th) and Capcom’s DmC: Devil May Cry (6th). The Wii U's woes kept up last month. According to aCNET report, the industry-tracking NPD Group's January sales figures had Nintendo's newest system selling 57,000 units in the US (Update: NPD has now confirmed this number with GamesIndustry International). The best-selling hardware of the month, Microsoft's Xbox 360, moved 281,000 systems, outselling Nintendo's latest nearly five times over. While Nintendo president Satoru Iwata described the system as "not bad" and "selling steadily" last month, the company later cut its sales targets for its current fiscal year. It had originally projected to sell 5.5 million systems through March, but now puts the number closer to 4 million. As of the end of December, the Wii U had racked up sales of 3.06 million worldwide. Nintendo has recently tried to spark interest in the system with a number of new game announcements. A week before cutting its sales forecasts, the company helda Nintendo Direct presentation in which it confirmed two new Mario titles would be playable at this year's E3 and announced two Zelda games, among other titles. In a note to GamesIndustry International, EEDAR analyst Jesse Divnich cautioned that Nintendo's performance shouldn't be judged by the Wii U alone. "While the Wii U's results were discouraging, Nintendo's platforms as an aggregate outperformed the other console manufacturers," Divnich said. "Nintendo's platforms represented over 40 percent of the consoles sold in January. I have to wonder if the Wii and the Nintendo DS have longer legs than what we've all originally expected and whether Nintendo is competing more against itself than other console manufacturers." For now, Divnich sees Nintendo "retaining a large and active user base" across several devices, but he noted that pricing is still going to be a big factor. "Closing that pricing gap [with other consoles] long-term is a critical component for the Wii U's long-term success," he said. Nintendo recently announced a Pokémon Mystery Dungeon: Gates to Infinity release date of May 17 in Europe. Released in Japan in November 2012 and in the US on March 24, the 3DS game will be available in stores and as a download from the eShop.The platform holder also outlined plans torelease new download content for the game "on a regular basis" from launch. The download content will range from new Mystery Dungeons to explore, new items to collect and new Pokémon to interact with. Nintendo says it will follow up with additional content to "launch regularly throughout April". A new trailer offering a peek at the DLC is through here. Activision has announced plans to launch Angry Birds Trilogy on Wii and Wii U in 2013. The publisher also revealed today that the Xbox 360, PS3 and 3DS game - which released in September 2012 and supports Kinect, Move and StreetPass features - has cleared one million sales.Angry Birds Trilogy combines Rovio mobile titles Angry Birds, Angry Birds Seasons and Angry Birds Rio, while adding new content, levels and features. Activision Publishing VP of sales and marketing Jennifer Mirabelli said: "Angry Birds' proven formula for fun and addicting gameplay translated perfectly to the big screen and the consumer response has been overwhelming." Rovio executive vice president of games Petri Järvilehto added: "The features specific to the Wii U are very intriguing to us, so we're excited to release this version to fans." BestBuy.com wants you to start your weekend with some much needed self-indulgence, because, like a supermodel slathered in megaprettyoxide-infused war paint, you're worth it. 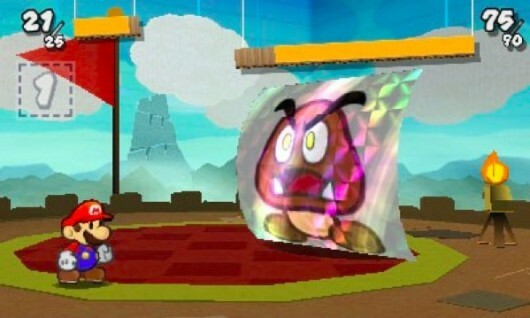 So why not treat your beauticious self to Paper Mario: Sticker Star, going at $19.99, or Kid Icarus: Uprising for $14.99? Of course, you might feel you're worth that and quite a bit more. If so, you could always plump for Epic Mickey 2 on Wii at $11.99, or Darksiders 2 on PS3 or Xbox 360 at $14.99. Update: As you eagle-eyed commenters spotted, Professor Layton and Miracle Mask, which was sold out at the time of writing, is available once more at$14.99. Also going at $14.99 is Pokémon Black/White 2. 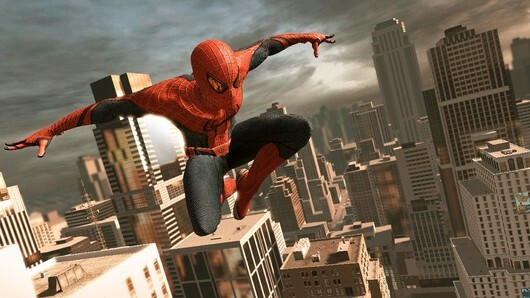 In the chill of the March 5 night, The Amazing Spider-Man arrives like a streak of light on Wii U in North America - well, in the cool of the March 5 day to be accurate. Europeans can take a look overhead to see it swing a thread onto continental retail shelves on March 8. The Wii U is getting the Ultimate Edition of The Amazing Spider-Man, which bundles in the four DLC packs released for the other versions, including the one that lets you play as Stan Lee - every DLC pack for every game should let you play as Stan Lee. It also supports off-TV play, or if you prefer you can turn the GamePad into a cell-phone with which you can take on new challenges, find your way around the city, and order Spider-pizza sustenance. Finally, you can browse your neighborhood through the tiny window of your Wii U GamePad. 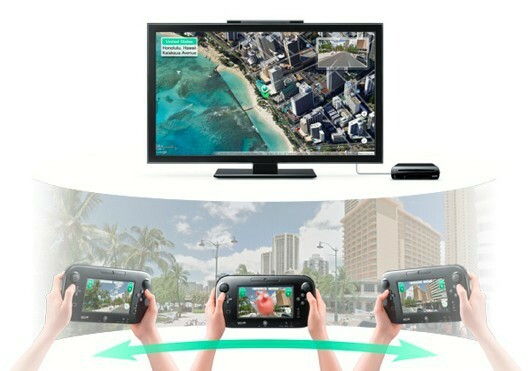 Wii Street U is free on the Wii U eShop today for a limited time, enabling augmented reality Google Street View. Grab it now, because it seems unlikely you'd want to pay for it. Meanwhile on 3DS eShop: video games! The NES version of arcade classic Dig Dug is available, as is a demo for chibi action game Naruto Powerful Shippuden. Bit.Trip Saga is also discounted. If you lack even one of the Bit.Trip games, this is a great way to get them all in a portable format. 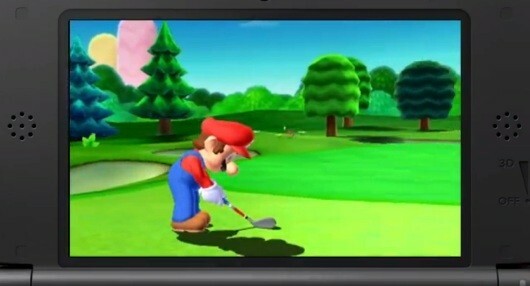 The Mario Golf series is taking to the 3DS fairway with World Tour, releasing this summer, as detailed by Nintendo president Satoru Iwata in this morning'sNintendo Direct broadcast. The 3DS entry. from series developer Camelot, features both traditional golf courses and ones inspired by the Mario series, and a roster that includes Mario, Luigi, Wario, Waluigi, Bowser, and Donkey Kong. WiiLauncher is a simple alternative to Gecko OS application. It has most of the Gecko OS features and has additional features for downloading and editing cheat codes. WiiLauncher automatically reloads and patches IOS 36 so there is no need to install unofficial (patched) or even custom IOS to run the channels (with the debugger or cheat codes) or the rebooter features. Full hardware access (AHBPROT) is used when applying such run-time patches. This access could be obtained by running WiiLauncher application from Homebrew Channel (version 1.0.7 or higher). 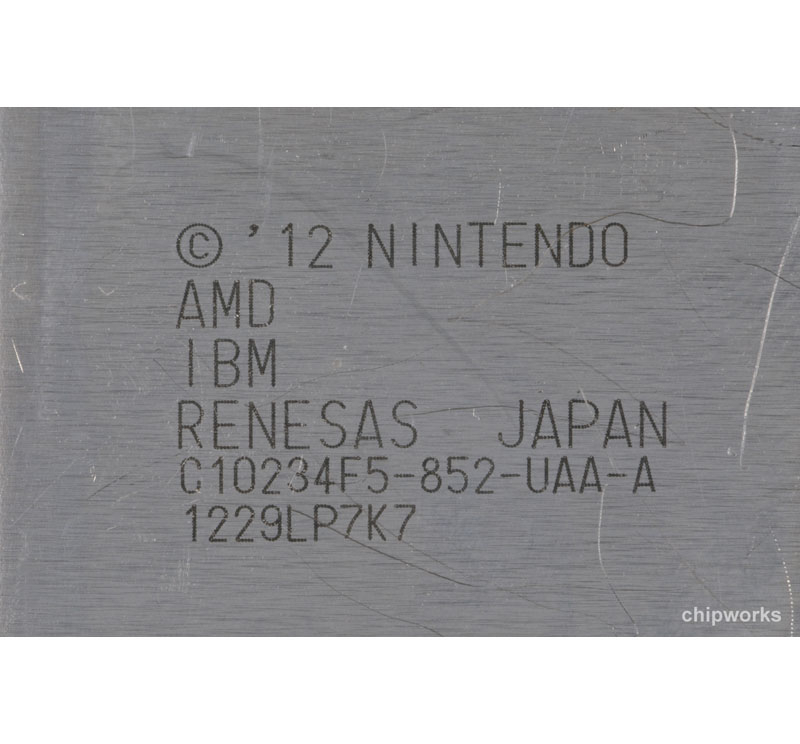 Marcan have added his annotations to a die photo (mirror here) of the Wii U CPU (codename Espresso) originally shot by chipworks.com. You can see the 'secret' 16K boot ROM marked on the image among other blocks of CPU logic." Luigi’s Mansion 2 (AKA Dark Moon in North America) is the game 3DS was born to play, or so Nintendo would have us believe. As revealed in an Iwata Asks session with original Luigi’s Mansion director Hideki Konno, the handheld owes a debt to his prototype for a stereoscopic LCD add-on for GameCube, which was paired with a 3D version of his spook-hunting game.Entering the first of five new mansions, Ghastly Manor, it’s easy to see the attraction of marrying this series with 3D. The game is viewed in cross section, and pushing up the 3DS’s depth slider sees rooms sink back into the murk, offering the sense of peeking into a peculiarly Gothic dollhouse. Combined with subtle gyroscope use to gently tilt the rooms, it rekindles 3DS’s initial capacity to wow. The Nintendo 3DS trailer for Donkey Kong Country Returns 3D has appeared online, after its release on the eShop last week. The game, a remake of Wii title Donkey Kong Country Returns, will release in Japan, Europe and North America this summer.Developed by Retro Studios and released in 2010, Donkey Kong Country Returns was generally well received for its colourful visuals and challenging gameplay. The original Wii version of the game sold more than 5 million copies worldwide. Square Enix has announced a Wii U Dragon Quest X release date of March 30 in Japan. Featuring enhanced graphics and support for GamePad-only play, the MMORPG will offer the same basic content as the chart-topping Wii version, which launched in Japan last August and reportedly amassed 300,000 subscribers by the end of the following month.Dragon Quest X will retail for 6,980 yen (£48 / $75) and include a ticket granting access to 20 days of online play, Siliconera reports. A Dragon Quest X hardware bundle featuring a premium Wii U console, the game, a black Pro Controller, a Nintendo prepaid card worth 1,000 yen (£7 / $11), and five super health orbs will cost 42,000 yen (£292 / $453). It will also include access to a Wii U beta test kicking off on March 6. Check out a new batch of screenshots from the game below (thanks AGB). Once you've had a look, you might want to watch the Wii U version in action in this Dragon Quest X trailer. Western Dragon Quest X releases dates have yet to be announced. 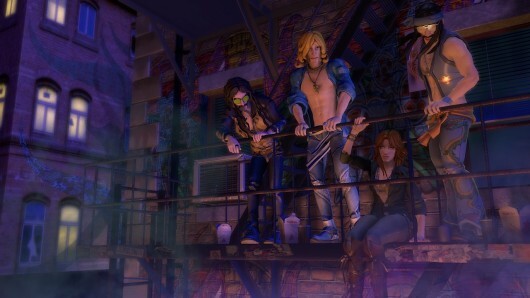 The final weekly DLC release for Rock Band will be issued on April 2, Harmonix announced today. Due to other ongoing projects at the studio, production onRock Band DLC has slowed in recent months. Up until April 2, Harmonix willrelease weekly DLC per usual. Harmonix has been issuing Rock Band DLC songs for over 275 consecutive weeks, which comes to over five years of consistent weekly releases. The Rock Band DLC catalog includes over 4,000 supplemental tracks, spanning all Rock Band games and the Rock Band Network. Still angry about the fresh delay to the Wii U version of Rayman Legends? Well, firstly, chill out. It’s a game. It’s fine. You’ll still get it and that other console owners will also get it is of no actual consequence to you. But nonetheless, Ubisoft is clearly a more benevolent beast than us and has said that it will release the game’s Online Challenge mode as a free download on Nintendo’s machine this April – five months before its official release. Challenges will be generated daily and a Wii U-only dungeon setting will also be made available. MCV reported this morning that three retailers have listed a Wii U version of upcoming sci-fi romp Watch Dogs. Add that possible release to the Rayman news and perhaps Ubisoft can still be BFFs with the Wii U’s more dedicated fan base? U can save on ZombiU, along with the rest of Ubisoft's Wii U lineup this week. From today through February 26, downloads of full games from the publisher are 30% off. That puts ZombiU and Assassin's Creed 3 at $41.99 each, and Just Dance 4, Rabbids Land, Your Shape: Fitness Evolved 2013, and ESPN Sports Connectionat $34.99 each. It's a good time to load up on Ubigames, as long as you remember to factor in the cost of an extra hard drive. This isn't the only sale happening on eShop: pick up F-Zero for 30 centstomorrow. Nintendo is returning to the huge European consumer games trade show Gamescom this year after its absence from the show in 2012. Gamescom, which takes place in Cologne from August 21st to 25th, will showcase games from hundreds of the biggest games companies in the sector. Nintendo did not give a reason for its decision to skip the event last year, months before the launch of the Wii U worldwide, despite stating Gamescom was “one of the most important fairs for us”. “The next chapter of Gamescom is being written and once again promises the best in entertainment,” said Gamescom project manager Tim Endres. “Nintendo's return is an absolute highlight for our community, exhibitors and trade visitors from around the world. We are also in very promising talks with other key players in the industry with regard to Gamescom 2013." For a few years now, [Michael] has wanted to put the guts of a Game Boy Advance – the small clamshell version with a backlit LCD – into the classic and comfortable DMG-01 ‘brick’ Game Boy. He’s finally finished with his project, and we’ve got to say it’s looking pretty good. The build began by excising the backlit LCD from an old clamshell Game Boy Advance and hot gluing it to the screen bezel of an old DMG-01. The cartridge slot from the original ‘brick’ Game Boy remained, but this design decision did require a fair bit of soldering and a length of ribbon cable. Since [Michael] is using the original cartridge slot found in the original Game Boy, he can’t play any games in the smaller Game Boy Advance cartridge format. Still, it should be possible to build an adapter to fit those smaller cartridges inside the larger Game Boy, and he can always play Tetris and Little Sound DJ, so nothing of value is lost. Atlus' Shin Megami Tensei 4 is scheduled to launch in Japan this May. Ruliweb(via Siliconera) grabbed the release date of May 23 out of this week's Famitsu magazine in Japan. There is also a special SMT4-themed Nintendo 3DS XL scheduled for release on launch day with the game pre-installed. There is currently no announced international release window for Shin Megami Tensei 4. If you're not familiar with the series, we have an editorial on why fans of JRPGs are anticipating it. European Wii U owners get to play F-Zero at the same speed as North Americans - always handy with a racing game - when the SNES classic arrives on the Wii U's Virtual Console this week. The news of the 60Hz version coming to Europe follows the criticism Nintendo received last month for releasing a 50Hz version of Balloon Fight. Games running at 50Hz, which they used to in Europe because over there older TV sets only displayed the lower refresh rate, run noticeably slower than their 60Hz counterparts, as clearly demonstrated by audio and side-by-side comparisons. F-Zero isn't the only Nintendo download racing into Europe this week. Demos for Monster Hunter 3 Ultimate (both on 3DS and Wii U), Trine 2: Director's Cuton Wii U, and Castlevania: Lords of Shadow - Mirror of Fate on 3DS are speeding their way there, as is a full-blown releases for NightSky on 3DS. Nintendo has released a list of new digital content, dominated this week by new Wii U and 3DS titles. Monster Hunter 3 Ultimate - Demo Version - Discover the epic world of Monster Hunter as you journey through more than 200 exhilarating quests, battle larger-than-life monsters and create hundreds of weapons and armor. Hunt with your two AI companions in single-player quests or team up with up to three friends in four-player online battles. Visually stunning HD graphics deliver a unique and stunning world for players to explore, and with the addition of online chat, this is the best Monster Hunter experience to date. F-Zero - Speed into the future with the first installment of the F-Zero series. Originally released on the Super NES, strategy will play a big part in this classic game as you choose between four proton-powered hover cars and race across 15 courses filled with challenges and pitfalls. Find shortcuts, elude hazards and snag power-ups if you want to beat the competition. 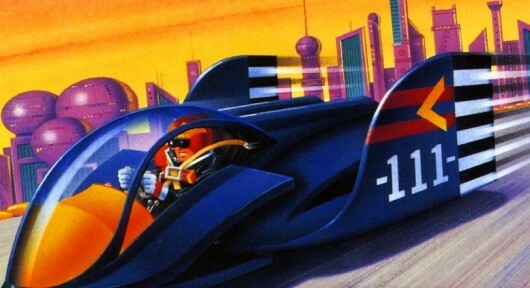 F-Zero is the second game released on the Virtual Console for Wii U to celebrate the 30th anniversary of the Famicom. For a limited time, the game will be available for only 30 cents. Nintendo has confirmed that The Legend Of Zelda: Oracle Of Ages and Oracle Of Seasons will be coming to the 3DS Virtual Console in Japan, making a future western release very likely. Both games were released on the same day for the Game Boy Color and are unique in that they weren't developed by Nintendo, but by Capcom. Da-da-da-daaaaaaThis has led to confusion among Nintendo fans, some of whom were under the impression that since the Oracle games had never been confirmed for the 3DS Virtual Console there was a possibility that there was some licensing reason preventing it from happening.Now that both games have been confirmed it's clear this is not the case, and due to the popularity of Zelda it now seems all but certain that the Oracle games will be released on the US and European 3DS eShop too in the future. Once both games are released, every main Zelda game in the series' history will be playable on current-gen hardware. 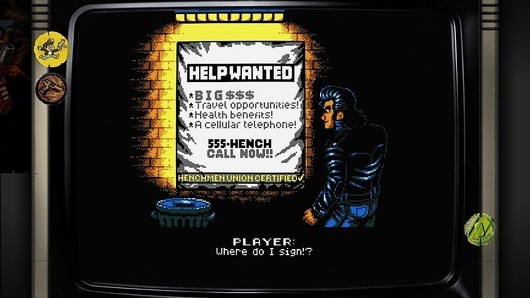 Retro City Rampage's long, pixelated journey to WiiWare finally comes to an end next week. The campy parody crime game will land on WiiWare on February 28 for $10. The Wii release will also feature the bonus "ROM City Rampage," which will allow players to "experience what Retro City Rampagecould've been like if it were actually released in the '80s, as a 100% NES hardware-accurate ROM." ROM City Rampage will be accessible via the in-game arcade. PC players will also get to experience the bonus mode thanks to a free update scheduled to release alongside the WiiWare version. Creator Brian Provinciano also reminds Wii U owners that they will be able buy and play the game using the Wii menu. Finally, the Steam version of Retro City Rampage is on sale this week for $7.50, half the usual price. The sale ends on February 28. This week's new Fire Emblem: Awakening DLC is "The Lost Bloodlines 1," available alone for $3 or as a $6 bundle that also grants you two more maps when they're released. 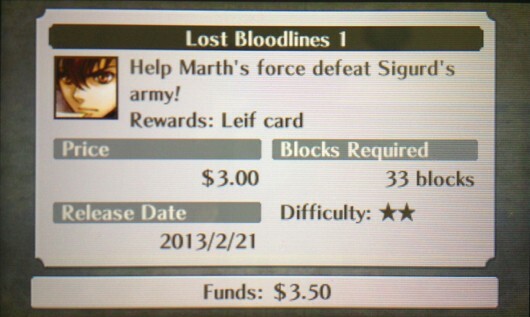 Successful completion of this map unlocks a card to summon Leif from past Fire Emblems. If you're a Fire Emblem fan, this may be exciting to you; as someone who has jumped into the series with Awakening, all I can say is that his sword has been pretty good when my other characters have found it. Other DLC available include three "Champions of Yore" maps and a bundle, and the "Golden Pack," led by the "Golden Gaffe" pack, which promises to earn you lots of in-game cash. It's not like paying for in-game currency because thankfully there's a Fire Emblem map between your expenditure and the virtual money. All first and second generation Pokemon are obtainable… and not just catchable… you can actually evolve without trading… Haunter evolves by level… so you can train your Gastly into a Gengar, instead of being forced to stop at Haunter and catch a wild Gengar (as in my previous hack and several others). Mew is obtainable EARLY… so he is actually usable as a team member instead of a trophy legendary. New events have been added and new maps, some new text… and a Catch Your First Pokemon event… simply talk to Oak without picking one of his 3 Pokeballs and you will be offered the chance to catch your starter. Although announced to put a little aside to develop its cmIOS famous for running GC games from USB or SD Crediar now offers a small update to fix this problem appeared since some versions. In order to know when the black screen patches "progressive mode" and "padhook" were used together. , it is now possible to enjoy the 480p (progressive mode) while retaining the possibility of using shortcuts handle (padhook ) to turn off or restart the console for example. As usual, DM is provided in the form of a WAD file that overwrites the original wii mIOS (IOS ensuring backward compatibility Gamecube). Drenn has been building a NEW Gameboy and Gameboy Color emulator for the DS, and has just released the first public version for the community to try out. Exciting news for coders is that the developer has made his project open source, unlike the closed source Lameboy. Please join the on-going discussion linked below for the full story about this WIP homebrew. Current Features (02/22/13) said:	[INDENT][LIST][*]- Runs most original gb games fullspeed, and a number of double-speed gbc games as well (Wario Land 3 is quite playable, and the oracle games... almost). It's not as fast as lameboy, yet. - Supports sound, saving, real-time clock (same format as lameboy), and roms of any size. - Sound emulation is hit-and-miss... some games, like pokemon RBY (even pikachu's cry!) and GSC, sound excellent, while others have various issues. - Press R to open the menu. - Press X to save your data to the filesystem. - When you choose the "Load ROM" option, your game is saved automatically. - It looks for roms in the "lameboy" directory by default, to make your life easier. - Games which don't run at full speed are more prone to graphical glitches. You can turn on "Wait for Vblank" to avoid this, but your FPS will drop to about 30. It's better to just leave it off. - Don't deactivate the "hblank" option. You've been warned. - Super Mali Hero Legends (Unl)[!]. Today we have two more mario-hacks in our collection. First of all, "Little Ninja Brothers" hack (Japanese "Super Chinese 2"). Cart label said "Super Mali Hero Legends", while the title screen says "Hero Mali Brothers". So, hack was just obvious. As most of the other mario-hacks, this one is using a special PCB with the permutation of the address and the data lines, based on the MMC3, mapper known as 196 and working on the most modern emulators. - Super Mali Splash Bomb (Unl)[U][!]. Second one, one of a few dumps on my hdd left unemulated, while dumped a long time ago. It using the same permutated PCB as the dump mentioned above, but with slightly different permutation, additionally permuted on the logic level, so this need also mapper modificaion. So I added a new UNIF mapper MALISB to play it. Use latest FCEUmm or FCEUX. Hacked game is "Keroppi to Keroriinu no Splash Bomb! ", and hack is very glitchy. There is only one CHR bank from two with the font was badly translated, so not only the title menu text was badly translated, but also a bad ingame text "animated" too along with the fire or the water animations, while it doesn't. - UNIF MALISB - New dump "Mali Splash Bomb". Fceux SVN r2836 is compiled. FCEUX is a cross platform, NTSC and PAL Famicom/NES emulator that is an evolution of the original FCE Ultra emulator. Over time FCE Ultra had separated into many separate branches. The concept behind FCEUX is to merge elements from FCE Ultra, FCEU rerecording, FCEUXD, FCEUXDSP, and FCEU-mm into a single branch of FCEU. As the X implies, it is an all-encompassing FCEU emulator that gives the best of all worlds for the general player, the ROM-hacking community, and the Tool-Assisted Speedrun Community. Dolphin wii-network Git 3.5-572 is compiled. Dolphin wii-network is a branch of Dolphin. Dolphin is the first Gamecube emulator able to run commercial games! Dolphin is a great Gamecube(NGC) and Wii emulator. It has a partial Wii support and plays most Gamecube games. Dolphin has been changed SVN to Git recently. WayForward's Mighty Switch Force is getting a sequel on 3DS, announced director Austin Ivansmith.The reveal was made on Destructoid's Sup, Holmes? webcast where Ivansmith noted it will be out in "in the next few months. "The first Mighty Switch Force starred cutesy cop Patricia Wagon who was tasked with busting lawless laddies, but this time around she'll have "a surprise career change." Composer Jake "Virt" Kaufman will return to write the soundtrack.Our Chris Donlan called the first game "clever, personable, and beautifully made," in hisMighty Switch Force review, where he awarded it an 8/10.An enhanced version called Mighty Switch Force! Hyper Drive Edition was later released on the Wii U eShop as a launch title for Nintendo's console. Ivansmith didn't mention anything about a Wii U version of the sequel, but I've asked WayForward anyway just in case and will let you all know if I hear anything. - Fixed bug that would cause nemulator to hang when selecting an invalid image from the menu. DeSmuME SVN r4545 is compiled. DeSmuME is an open source Nintendo DS(NDS) emulator for Linux, Mac OS and Windows. DeSmuME supports save states, the ability to increase the size of the screen and it supports filters to improve image quality. DeSmuME also supports microphone use on Windows and Linux ports, as well as direct video and audio recording. The emulator also features a built-in movie recorder. UK retailers have priced Nintendo’s Wii Mini, announced yesterday, at £80.Amazon and Game are offering the console, which launches in the UK on March 22, for £79.99. Both sell the standard Wii for £129.99.Nintendo commonly leaves hardware pricing up to retailers, and doesn’t provide an RRP in its announcements. The Wii U version of Sniper Elite V2 could prove to be an on-going seller like its 360 and PS3 forebears, says publisher 505 Games. The game uses the Wii U GamePad to track enemy positions and set traps. Sniper Elite V2 first appeared on Xbox 360 and PS3 in April 2011 and, after a surprisingly strong launch, continued to be a regular in the charts throughout the following months. The Wii U version of Sniper Elite V2 is due for release in spring. 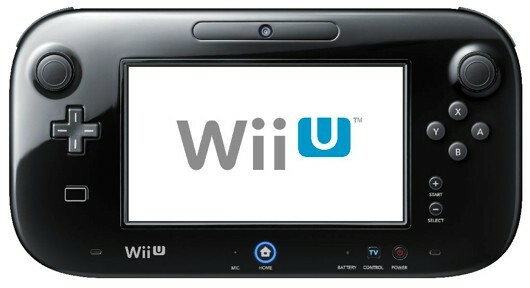 Nintendo’s Wii U failed to outsell Sony’s struggling PlayStation Vita in Japan last week. The news is a big blow for the machine that initially started strongly in Japan, although sales have now significantly tailed off. Media Create numbers reported by Eurogamer show that Nintendo’s machine sold just 9,633 units last week – somewhat short of Vita’s 11,456 unit sales, although that is Vita’s best performance for a while. Note too that Sony slashes the price of the handheld this week, meaning a spike is likely in next week’s numbers. PS3 sales last week hit 18,529 units while the mighty 3Ds shifted an impressive 74,729. The creator of this project started off with a 7″ tablet he received from a coworker. The screen was horribly smashed from one corner spreading out through the entire surface. But the hardware inside still worked, including the HDMI out port. He ended uptransplanting the tablet hardware for use as an emulator. After a bit of sizing up it was determined that the tablet hardware would fit inside the case of a broken NES. The battery would have been a tough fit, but this thing is always going to need to be connected to a television so there’s no need to work without mains power. The back plate was cut down to size and used as a try for mounting the motherboard in the case. Before that step he wired up a USB hub and mounted it so that two ports could be accessed through the original controller port openings. There’s no details on the software used, but the final image in the gallery shows a game of Starfox being played. An arm injury has affected Masahiro Sakurai's work on the next installment of Super Smash Bros, the game creator has announced. The famed developer Kirby has revealed he is suffering from calcific tendonitis, as well as several ruptures in his arm muscles. He reveals in his regular column in Famitsu that this has resulted in chronic arm pain which affects him most when using a keyboard or game controller.Translated by Polygon Sakurai admits that "if this disorder lingers, or never gets fixed, there's no telling what impact that would have on [Super Smash Bros]. "Playtesting for Super Smash Bros has proved difficult for Sakurai as he explains "I've had to control two characters at once in a lot of game projects up to now," he said, "so as long as I keep it to simple moves, this works well enough. It doesn't go that easy with the Nintendo 3DS version, though, and the debug camera is pretty hard to control. "Despite the injury, and Sakurai's concern that it will impact development, there has been no mention of a delay at this stage. A former Sony employee has sued Nintendo over its use of glassless 3D technology in the 3DS handheld console.58-year-old inventor Seijiro Tomita patented a way of providing 3D images without the need for glasses and he's taken Nintendo to seek damages - a whopping $9.80 for every 3DS sold. As of the end of 2012, Nintendo had sold 29.84 million 3DS units. If Tomita gets what he wants, he's in for a cool $292 million. Good luck!Reuters reported opening arguments from Monday's meeting in the US District Court in New York.Tomita's attorney Joe Diamante said his client met with Nintendo in 2003 to discuss the patent and showed a prototype to seven Nintendo officials at the company's Kyoto headquarters while his patent application was pending. Four of the seven executives went on to develop the 3DS. "He actually felt betrayed and hurt that they were using his technology," Diamante said.Nintendo's representative Scott Lindvall countered this by saying the 3DS doesn't use key aspects of Tomita's patent, and that the 2003 meeting was one of several Nintendo held with vendors selling 3D display tech. One of these, held a year earlier in 2002, was with Sharp, which eventually made the 3DS display.Tomita, who holds 3D display patents in the US and in Japan, is in a wheelchair as he recovers from a stroke. He quit Sony in 2002 after 30 years of service to pursue inventions, but since the release of the 3DS has struggled to find someone to license his tech.The case continues. Arthur Matthews and Graham Linehan, creators of the classic sitcom Father Ted, were once asked why they'd chosen to make a comedy about priests. Was there, perhaps, some critical commentary on Catholicism at work? No, replied the writers. The jokes were just funnier when performed by priests.The same could be said of Lego minifigures. There's just something inherently daft and likeable about those yellow-faced fellows that highlights the absurdity of any situation, even if that situation involves driving a fire engine along the pavement, mowing down dozens of pedestrians. In a game like Grand Theft Auto, such a scene would be bleak, bloody and dripping with nihilistic catharsis. In Wii U exclusive Lego City Undercover's breezy free roaming world, it's a slapstick gag. Splattered pedestrians simply spring back to their feet and stagger away. Hero cop Chase McCain even apologises as he speeds on his way, leaving plastic carnage in his wake.It's one of many delightful details in a game that always finds a way to incorporate the transgressive thrills of more mature rated openworld city games, without ever losing its daft kid-friendly charm. In fact, according to developer TT Fusion, the words grand, theft and auto were never even part of the conversation. "I don't think we ever really borrowed from that genre," insists Graham Goring, Lego City's scriptwriter. "We never said 'Oh, what have they done in that game? Let's do a family friendly version of that.' It was predicated on things we'd done in Lego games previously, and new ideas that the GamePad gave us. Internally, we could ignore other open world games because, thematically, they are so much darker." Bit.Trip series creator Gaijin Games is releasing its sequel to its retro auto-running sidescroller Bit.Trip Runner this week with the splendidly titled Runner2: Future Legend of Rhythm Alien.As tweeted by Gaijin Games, Runner2 is out today on Steam for PC and Mac as well as on the Wii U eShop in the US, so probably Thursday in Europe. Tomorrow it will arrive on XBLA, and it's due on PSN 5th March in the US, so likely the following day in Europe.We've contacted Gaijin Games about confirming the European release dates and will update as we hear back.Vita and iOS ports are due this summer. Joining Sega in the unlikely trend of video game-themed Japanese laptops, Capcom is looking to release a Mega Man special edition Ultrabook PC. And, like Capcom tends to do for Mega Man projects, it's polling fans to find the best design. As this inscrutable practice takes off, we feel the need to document it. A poll is up for the Ultrabook, with users allowed to vote once per day to select whether a generic "Rockman" design, tiled Dr. Wily and Robot Masters (the correct choice), overwrought NES box art-style Mega Man, or a pile of various Rolls will emblazon the laptop. Lego Batman 2: DC Super Heroes is coming to the Wii U, bringing its frivolous mix of caped crusaders and block building to the Nintendo console worldwide this spring. Publisher Warner Bros. Interactive announced the news today, revealing the Wii U version will support off-TV mode in both single-player and co-op, although players can employ the GamePad to access an "enhanced" map and touch-based character selection. The news also completes the game's console collection, having already released for DS, 3DS, Vita, PS3, Xbox 360, and Wii, as well as PC and Mac. So when the PS4 comes around, we'll know what to expect, hmm? Or not... we don't know, really. 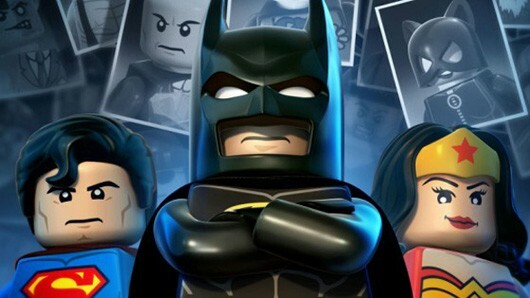 Warner Bros. also revealed the superhero sequel is up to 3.4 million copies sold worldwide, which, while impressive, is a fair ways behind the 11 million the original Lego Batman sold. NES homebrewer never-obsolete is working on a Zelda style RPG for NES called Knil. According to the developer the core engine is done, which means he now tries to add up the content. As the game is still a work in progress, there is no download yet. NOTE: you must delete coleco/config.ini before using this version ! NOTE: you must delete coleco/config.ini before using this version !! NOTE: you must delete coleco/config.ini before using this version !!! This is a port of Gnuboy, a Gameboy/Gameboy Color emulator originally created by Laguna & Gilgamesh, running on the Gamecube and Wii using libogc development library. OK - I'm taking a risk here with this release - normally I can test out Gamecube builds on my 64MB SD card with a Wiikey SD Adapter, but I have lost it and my 512MB SD card is not picked up by SDLOAD.DOL (to add to the chore I also have to go through the Phantasy Star Online exploit everytime). So I have been unable to test this beforehand even though a lot of things got changed. I'm mostly assuming that since the Wii port works, the Gamecube port (being more or less the same code) will also. I tried it and it was beyond my expection! Even CPS2 games could run at full speed! Though only one game (Super Puzzle Fighter II Turbo) could run, others CPS2 games got code dump screen after ROM was loaded. I think they are just too big for Gamecube RAM. I alse tried Nestopia core and it ran super mario 3 perfectly. FBA core is too big and swiss won't let you boot it. If you could seperate CPS1 drivers out and compile it then we could get a perfect CPS1 emu for Gamecube. FBA Neo Geo core also works as good as CPS2 core. More small sized games work, but if you want to change one game from another, you have to reset Gamecube, or you will only get black screen after another ROM is loaded. Maybe this bug is related to unclean RAM. Boot.dol doesn't work and after loaded it with Swiss, only black screen shows. After all, it shows brilliant prospects to Gamecube fans. Capcom is working on a post-launch patch for the Wii U version of Monster Hunter 3 Ultimate, which will add off-TV play and cross-region multiplayer. The patch will go live approximately one month after the game's March launch (some time in April, says Capcom).Once installed, Europe and US servers will be merged, allowing players in both regions to play together in games of up to four players.This signals a complete u-turn on Capcom's original plan to region-lock the game's multiplayer component, to the disappointment of fans and even Capcom USA's own community man Yuri L. Araujo, who publicly admitted, "I'm not thrilled with the servers being split either. 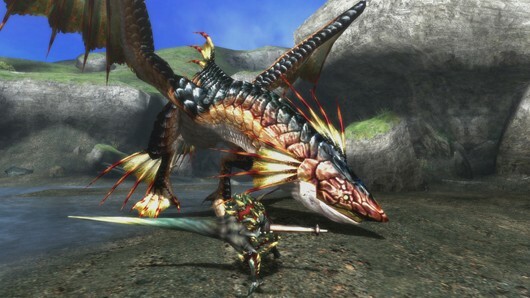 "The update will also add compatibility with Wii U's off-TV play feature, allowing for full gameplay to be transferred to the GamePad screen.Capcom says this update comes entirely as a result of "very loud and clear" community feedback.Monster Hunter 3 Ultimate will release for Wii U and 3DS in Europe on March 22, and North America on March 19 via both retail and digital (eShop) outlets. "Kickstarted, randomly-generated 2D Wii U platformer" is no longer the exclusive domain of Cloudberry Kingdom. With the announcement of Another Castle, it becomes an unexpectedly specific genre. Another Castle is the work of developer Uncade, the company name of lone wolf developer David Byers, and takes place in a series of randomly generated side-scrolling levels in which you look for an item which is, inevitably, not there – a reference to the elusive Princess Peach. When you finish the game, the item is unlocked and actually attainable in future playthroughs. Byers submitted a prototype to Nintendo and got approved as an eShop developer, suggesting that Nintendo is loosening its restrictions on things like developer size. Another Castle is planned for release on PC, Mac, Linux, iOS, Android, and Ouya in addition to Wii U. It's being supported by a Kickstarter, with a tiny $12,000 goal. A playable prototype can be found on the official site. The Wii Mini has sold 35,700 units since its launch in Canada on December 7.
, Nintendo of Canada's Communications Manager Matt Ryan said the numbers reflected positive uptake in the region.The Wii Mini will launch in Europe on March 22. The console is a pared back version of the original Wii with no online connectivity or SD card support. Guests online: 772. Total online: 772.